Rockwind Community Links, on the site of the former Ocotillo Park Golf Course, is a heralded new 27-hole public golf facility owned and operated by the City of Hobbs. Completely renovated and rebranded, Rockwind officially opened for play in 2015 and it provides the citizens of Hobbs with an amenity like no other in the country. “You’re not going to see many public facilities like this in the U.S.—it’s just phenomenal,” said PGA TOUR star Fred Couples at the grand opening. 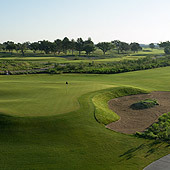 Rockwind offers a championship 18-hole course, a 9-hole par-3 course, a dual ended practice range and multiple short game areas. 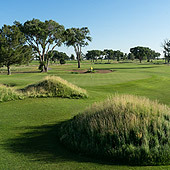 The main course, which includes five sets of tees with playing lengths ranging from over 7,100 yards for the accomplished player down to approximately 4,200 yards for the forward “express” tees, has been designed to embrace the flat nature of the southeastern New Mexico landscape, keeping irrigation to a minimum and the turf fast and firm. The design provides challenging features such as large elevated greens, disguised bunkers and interesting ground contours. Architect Andy Staples has incorporated characteristics typically found on courses along the eastern seaboard of the U.S. built during the turn of the 20th century. Rock walls line fairways and a large interior lake is in play on a few holes that attractively punctuates the course routing. The 9-hole par-3 course called Li’l Rock is meant to complement the expanded practice range and short game area. It was built to facilitate walking, families, beginner golfers and kids. The length of shots range from a sand wedge to a driver. Rockwind Community Links also participates as a member of The First Tee of Southeastern New Mexico. Rockwind Community Links is considered a trailblazer in uniting golf with the local community. 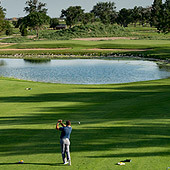 “Community Links” is a concept introduced by Staples where the focus of the entire project was to link the golf course to the fabric of life in Hobbs. A special feature is a surrounding trail system complete with multiple trail heads, various outdoor seating areas, picnic spaces and multiple scenic viewing points, including access to the site’s five acre lake that overlooks the golf course. General Manager/Head PGA Professional: Linda Howell, PGA Class "A"
Public Course-18–Holes plus 9 hole par 3. Weather permitting, the course is open year round. Currently closed on Tuesdays for course maintenance. Tee times are recommended and reservations may be made up to 7 days in advance by calling the golf shop 575.397.9297 or book on line at http://www.rockwindgolfcourse.com/golf/course-info/online-tee-times. Facility/Services: Fully stocked Pro Shop, putting greens, pitching greens, driving range, golf cars, rental clubs, pull carts, tournament services with on-site catering, PGA instruction, snack bar/grill and custom club fitting. Getting There: Located in Hobbs, New Mexico just off of the Lovington Highway.